More proof that New York is the greatest city on earth: The owner of Bran Castle, better known as Dracula's Castle is a New Yorker, and he's willing to sell the building to anyone with 78 million dollars! The castle is now owned by Dominic von Habsburg, the son of Princess Ileana of Romania who inherited the castle from her mother, Queen Marie. 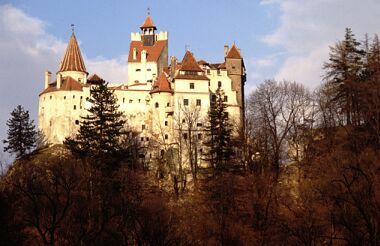 Von Habsburg lived in the castle until 1948 when, at the age of ten, he was forced to flee Romania as communists seized control of the country. He has lived in exile for the last sixty years, and now works as a furniture designer in New York. Last year, decades after it was seized by the communist government, the castle was returned to von Habsburg's family. Now the tourist attraction is for sale. For the New York Sun article on Dominic von Habsurg, click HERE. oops! sorry missed the last paragragh! hey ananka do you think hollywood would totally ruin the originality of the book if they made Kiki Strike: inside the shadow city a movie? cuz there are some really good books i've read that would come out in movies years after i'd read them and they would be terrible, do think Ms. Miller will let them turn itinto a movie? There may well be a movie someday, but you're right--it would be hard to do a good one. Maybe Tim Burton (my favorite director) could do a cool, creepy version.